John Cena is one of the most accomplished professional wrestlers in the history of the WWE. His magnetic personality and in-ring success have contributed to him becoming the face of the company. His popularity amongst the sports entertainment fan base is unmatched, even if he has many detractors as well. John Cena's appeal is so great that it has led to lucrative deals outside the ring including leading roles in action movies. 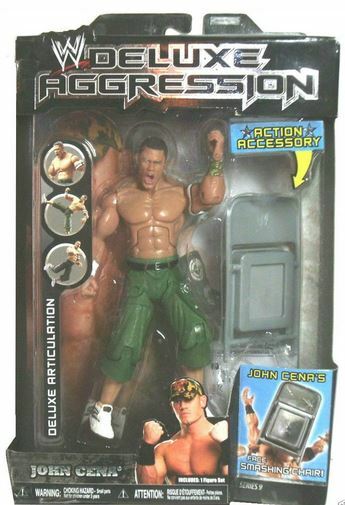 It should be no surprise that John Cena cards and memorabilia are top-sellers today. 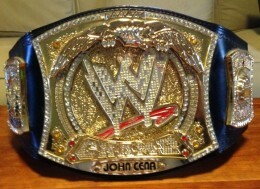 As the an 11-time World Champion and another three as Heavyweight Champion, Cena has shown little sign of slowing down. His contribution to the E! network's Total Divas show has further propelled him into the mainstream spotlight. Demand for John Cena autographs is strong despite being a willing in-person signer and a key part of WWE signing events. Topps currently holds the license for WWE trading cards. 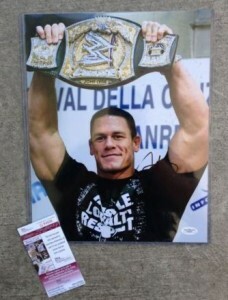 As such, Cena has several autograph and memorabilia cards in the market. Unfortunately, all but one of his certified autograph cards thus far are done on stickers. The hobby has been hard-pressed to adopt rookie cards for wrestlers. That said, the 2002 Fleer Royal Rumble John Cena is his first mainstream licensed card. So even if it's not acknowledged as such, it's, in essence a rookie card. The card features Cena readying an opponent for a slam..
2005 Topps WWE Heritage is the only set so far to have an on-card John Cena autograph. As a result, it is also one of his most popular cards. Relying on the tradition and novelty of the Heritage brand, the card resembles an old console TV. While many other wrestlers rely on costumes, face paint and outlandish robes for their ring attire, John Cena is a T-shirt and cargo shorts kind of guy. His T-shirts have been top sellers in the WWE for years. 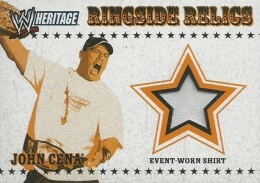 His first memorabilia card is, fittingly, a piece of an event-worn T-shirt from the popular 2005 Topps WWE Heritage Ringside Relics insert set. This is the first John Cena card to have both an autograph and a relic swatch. 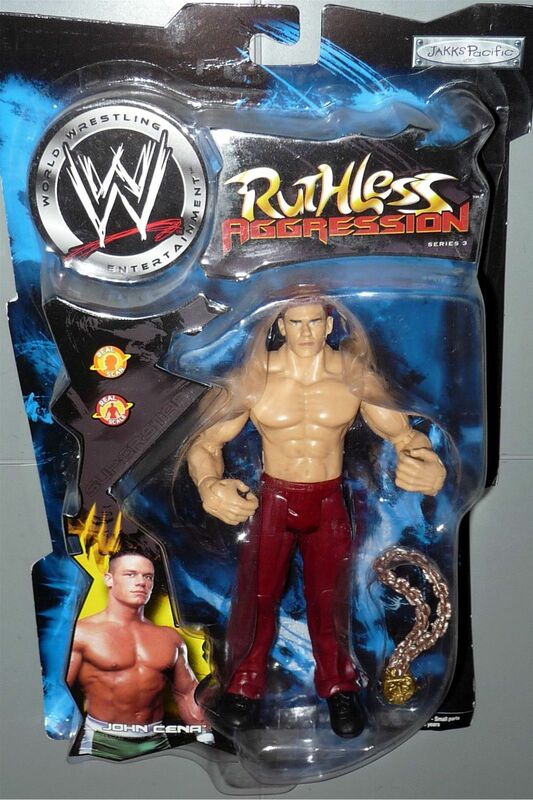 It features Cena preparing to pounce on his nemesis Randy Orton. The basic version is numbered to 275. There are also rarer colored parallels. 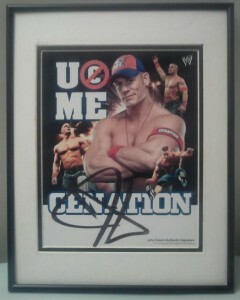 Below you will find examples of what an authentic John Cena signature autograph looks like. This can be used as a first point of reference for determining the legitimacy of autograph memorabilia, but is not a substitute for having your items authenticated by a well-respected professional autograph authentication company. Some of the trusted sources within the sports memorabilia market include the following companies: PSA, JSA, Tristar, WWE and Mounted Memories. Click on any of the images below to view full size photos. The entire signature is written on an even plane with just a very slight lean to the right but is almost vertical. The letter "J" is always defined and pronounced. The remaining letters of the first name are usually absent. The last name consists of a highly individualized character that contains a sharp, but short up stroke, a long, left-to-right line, and a small loop at the bottom of the signature. Early examples of John Cena's autograph are much neater, clearer and contain more discernible letters. His pen strokes are angular in nature as compared to being rounded. John Cena WWE Wrestlemania 30 Signed Autographed Plaque 117 of 500 Made. Wrestling fans and collectors know that action figures are more than mere toys. They are one of the most highly sought after wrestling collectibles available. Two companies have held the WWE license since John Cena began his career. Early figures were manufactured by Jakks Pacific while recent and current figures are being produced by Mattel. 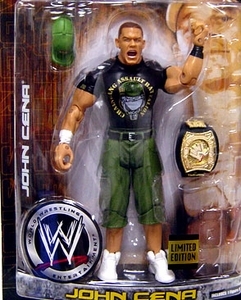 The 2003 WWE Survivor Series was one of Cena's early PPV performances and this figure commemorates that event. 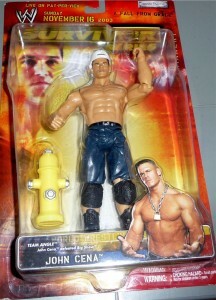 A rare figure, not in terms of production run, but that it features Cena wearing pants instead of his customary shorts. 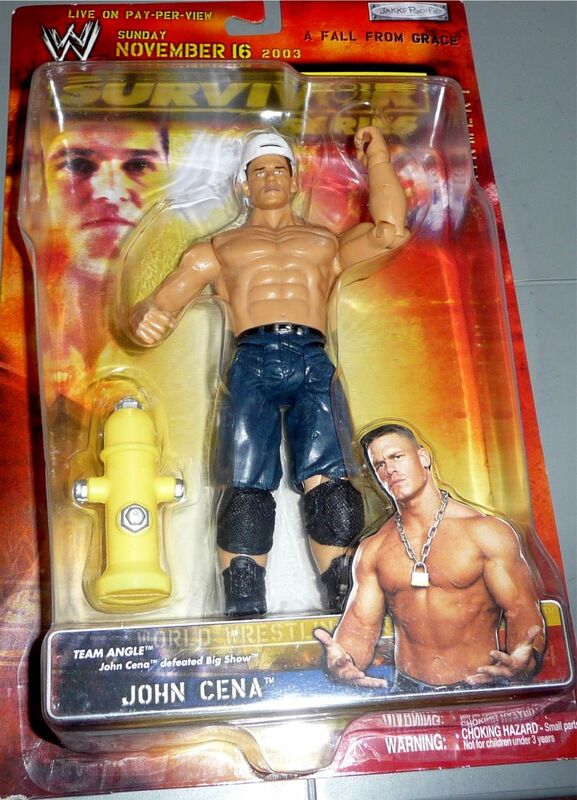 The figure comes with a chain and medallion, which was an iconic ring accessory in the early part of Cena's career. In addition to action figures, replica WWE Championship belts are quite collectible. This belt in particular can be very difficult to find new in box. These can command hundreds of dollars. These are also popular items to have signed. This belt is an exact replica that was introduced in 2004 at the Armageddon PPV. 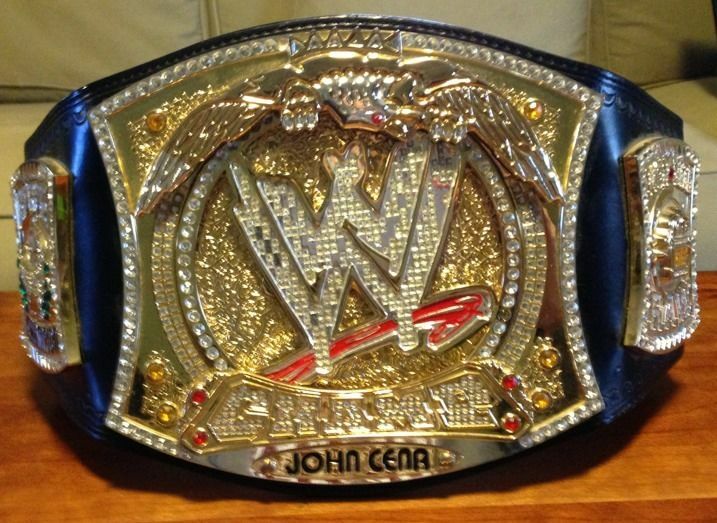 Cena is a multiple US Champion and this belt commemorates one of his earliest championships. This figure is accompanied by the lethal metal chair and as a result is very popular with collectors. John Cena's patriotism and support of the military is well documented. This limited edition figures pays tribute to that support. Cena is attired in a US Marines T-Shirt and is accompanied by a spinner Championship belt.